Free Oxytrol For Women Sample!! 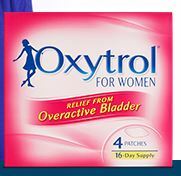 Fill out the short form HERE to get a FREE sample of Oxytrol for women! The first FDA approved over the counter treatment for over active bladder.